Remnants of an 18th-century ship found buried in soil 20 feet under the World Trade Center site four years ago have been traced to Colonial-Era Philadelphia, according to a new study. The 32-foot piece of the vessel was found in July 2010 as bulldozers excavated a parking garage for the future building. At the time, historians said the ship likely dated back to the 1700s, and that it was defunct by the time lower Manhattan's western shoreline covered it up around 1818. But the mystery of its origins persisted -- until now. Scientists at Columbia University's Lamont-Doherty Earth Observatory analyzed the skeletal remains of the ship using dendrochronology, which relies on tree rings to determine dates and chronological order. 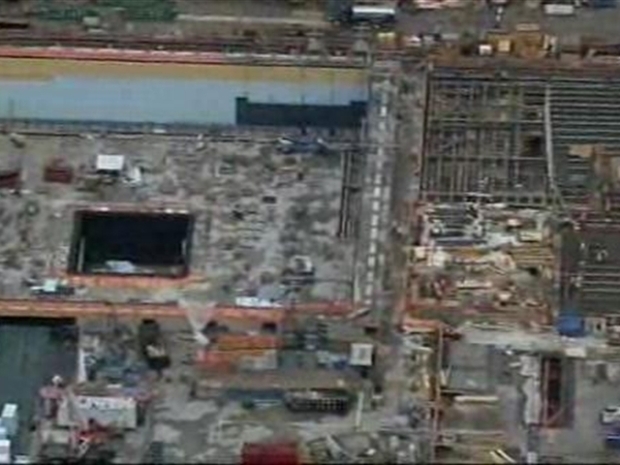 An astonishing discovery made by workers excavating the World Trade Center site. They've spent the last two days digging out a series of ribbed wood timbers...that were recognized today as belonging to a 30 foot ship. The vessel seems to date back to the 1700s. In a study published in the journal Tree Ring Research, the scientists say they traced the white oak used in the ship's frame to an old growth forest in the Philadelphia era. The article says the trees were probably cut around 1773, shortly before the Revolutionary War. Wood sampled from Independence Hall in Philadelphia 20 years ago had growth rings that matched those from the World Trade Center ship, suggesting the wood used in both constructions came from the same area. Scientists say they believe the ship is a Hudson River Sloop, designed by the Dutch to carry passengers and cargo over shallow, rocky water. The article says it was likely built in Philadelphia, a shipbuilding hub during the Colonial era, and used for 20 to 30 years before sailing to what would become its final stop in lower Manhattan. Workers and archaeologists had also found a 100-pound anchor in the same area as the ship, but it wasn't clear at the time if it belonged to the ship.